September 7, 2017 5:00 P.M.
Val Rita, ON -- The governments of Canada and Ontario are proud to partner to fund affordable rental housing for Indigenous residents in the northeastern Ontario Township of Val Rita-Harty. The development on De L'Église Avenue in Val Rita, spearheaded by Ontario Aboriginal Housing Services (OAHS), will provide 10 new units of affordable rental housing. The Honourable Jean-Yves Duclos, Minister of Families, Children and Social Development and Minister Responsible for Canada Mortgage and Housing Corporation (CMHC), and the Honourable Peter Milczyn, Minister of Housing and Minister Responsible for the Poverty Reduction Strategy, made the announcement. The new rental housing was celebrated at an event today at the Val Rita Recreational Park on Deschenaux Street as part of a tree planting celebration recognizing Indigenous peoples in Val Rita-Harty. The development received $1.7 million in combined federal and provincial funding through the Investment in Affordable Housing agreement. The development features two-bedroom units available for rent to people who self-identify as First Nation, Métis, or Inuit. OAHS is a corporation with a mandate to provide safe and affordable housing to urban and rural First Nation, Inuit and Métis people living off-reserve in Ontario. OAHS provides rent-geared-to-income homes throughout Ontario. Canada Mortgage and Housing Corporation (CMHC) has been helping Canadians meet their housing needs for more than 70 years. As Canada’s authority on housing, CMHC contributes to the stability of the housing market and financial system, provides support for Canadians in housing need, and offers unbiased housing research and advice to Canadian governments, consumers and the housing industry. Prudent risk management, strong corporate governance and transparency are cornerstones of CMHC’s operations. 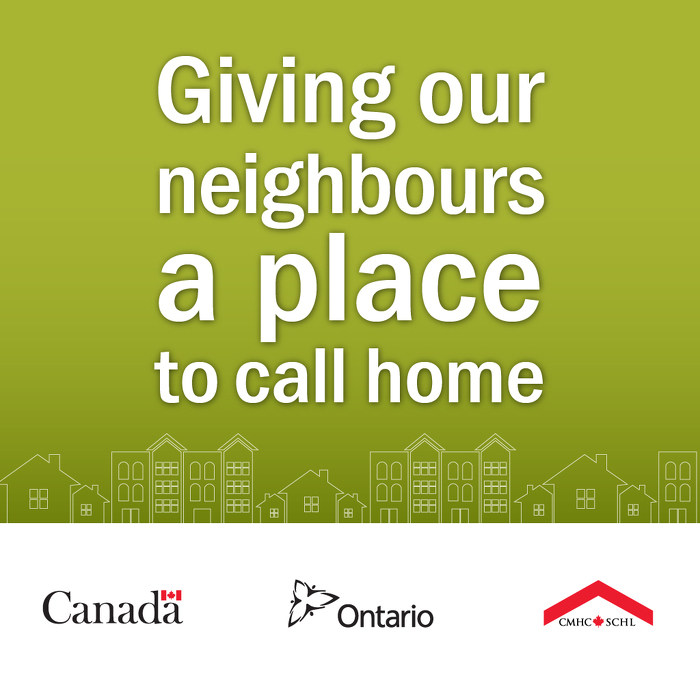 For more information, please call 1-800-668-2642 or visit www.cmhc.ca. Investing in affordable housing programs is part of Ontario’s plan to create jobs, grow the economy and help people in their everyday lives. Since 2003, the province has committed more than $5 billion in funding for affordable housing, which has helped support more than 22,000 new affordable rental housing units, more than 335,000 repairs and improvements to social and affordable housing units and rental and down payment assistance to more than 93,000 households in need. These investments complement the commitments made through Ontario’s recent Long-Term Affordable Housing Strategy update, and support the province’s goal of ending chronic homelessness by 2025. For more information on affordable housing in Ontario, visit ontario.ca/affordablehousing. Follow CMHC on Twitter, YouTube, LinkedIn and Facebook. Follow Ontario’s Ministry of Housing on Twitter. This document was published on September 07, 2017 and is provided for archival and research purposes.